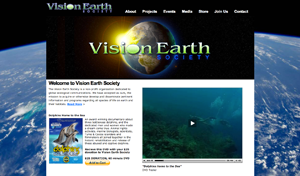 The Vision Earth Society came to life in 1993. While diving with dolphins during the filming of "Dolphins, Home to the Sea" a 52 minute documentary film, Cinematographer and Eco-Adventurer David Haylock realized that the planet was in real danger and people genuinely had no idea. He vowed to create an organization dedicated to educating the world through the powerful medium of film. It was a web cam that was instrumental in Vision Earth's incredible role in saving the "The Miami Circle." In 1999, at the mouth of the Miami River, respected archaeologists discovered a circle dating 1700 to 2000 years ago. This rare discovery, likened to Stonehenge in the United Kingdom was created by Native Americans in the form of a circle. The stones would indicate the seasons by measuring shadows. Shockingly the formation was on land scheduled to be bulldozed by a local developer. Vision Earth received a call and immediately responded by placing a web cam in a donated office overlooking the site to monitor the situation 24 hours a day. A fundraising and awareness campaign was also aggressively activated, involving many other activists in the city. Coast to Coast AM via Art Bell and Richard C. Hoagland were reporting every step of the way what was happening at the Circle site as Vision Earth video teams documented the rallies of public support for Saving The Circle. In the end The Miami Circle was saved. On February 5, 2002, the site was listed on the National Register of Historic Places. It was declared a National Historic Landmark on January 16, 2009. Planet Earth exists to nurture us, providing mental and physical sustenance and opportunity for growth as humankind evolves and reaches out into the Cosmos. Humankind's responsibility, in return, is to provide a beneficent stewardship that maintains and supports all life forms and resources for the betterment of all on this living planet. Vision Earth was also on the scene in 1993 when a fierce battle began to brew in the picturesque seaside town of Monterey, California. Surfers, divers and beach goers banded together against a strange breed of entrepreneurs. A few boat crews in the area thought it would be a good idea to get into the great white cage diving business. It was profitable and problematic as the chum(blood and guts) they dumped into the ocean attracted great white sharks, creating a danger for anyone not safely nestled within a steel cage. Vision Earth's coverage of the brouhaha of town meetings and half eaten surfboards left as warnings eventually wound up on Dateline NBC and SAT-1 TV, Germany. When the chum settled, the surfers were victorious. A law was passed banning the dumping of animal parts into the ocean, leaving the sharks and the town people to their preferred depths. It is Mr. Haylock's firm belief that education is the gateway to transformation and lasting change. Over time Vision Earth has grown into a multi-faceted organization, protecting the planet and championing the powerful impact that a plant based diet can have, both internally on one's health and externally on the environment.